Home » Forum » Business Discussion » Technology » Trying Out "MyOnlineToolbox.com"
Good at all it claims to be, go to the website www.myonlinetoolbox.com and read what it does. Its a management platform for the Lean and Mean of us. I carry a laptop, and do a lot of business with the help of my computer, I have a wireless printer and can go to your house and design your kitchen (2020 Design), print you a copy of the design and the contract and were done. Online tool box offers easy management for a lot of the ancillary work on job tracking, work orders ect. It does not do bookkeeping or estimating, but that is better done with a stand alone program. Good price, easy intuitive controls, and its always being improved because they listen to their customers. Very helpful staff. Cons, does not integrate with other programs (I'm no expert on this, I could be wrong). I'm going to give it a shot. Easy-Easy-Easy. Jessie and Paul how are you guys liking Tool box?? I chose another software but still think that this would be a good option for my subs to use. Have you guys got a good feel for it yet?? I've been so busy I haven't used it. You know the old complaint, hire a new guy to lighten the work load and its now more work than before? I was waiting for the new template and preset features to be released to get started. Our business has a tremendous amount of repeat tasks and tons of materials. The guys mentioned to me that they also promised this feature to a few other contractors. Am just starting to type them all in. My guy who is more familiar with computers is much faster than me, but it is pretty easy for someone who is just learning. I love to be able to create an entire service ticket like "no cool". This is simple and will save a lot of time. Will tell you more later. I am a new user for MyOnline Tool box for a few months and use for writing professional looking estimates that I can fax, email and print anywhere that I am located . I can save the file for clients that don’t have a printer. (they can see it as a PDF file on there desktop.) If I'm at my in-laws or friends house I can log on get something done that entered my mind before I forget. When I am collecting a check and there is a problem with the contract, invoice, etc... I can fix it on the spot print it and collect my money with out the pain of going back to the office. It saves me gas back and forth to the office. I can write an estimate on-site turn it in; close the deal on-site and look very efficient and professional while the other guys take a week to get it done at home because he cant remember the important details that were still fresh in my mind when i wrote it on site. So my bid is submitted and I‘m hanging out with the home owner or subcontractor showing them how I did it so fast (mobile office) . it also allows you to go into such detail as far as tracking expenses and material cost. all the presets help with getting the estimates done in half the time. i also love the task pane where you can have several jobs open at once and jump back and forth between them . The feature i want to see is when contractors start networking jobs back and forth. i think it comes out soon and I will check back in and update you all once I get a chance to test and use it. So far so good. As said before they keep "upgrading" instead of saying "well this is good enough boys" - so that is nice. We have been incredibly busy (not complaining ) and have not had the time to sit down and play with all of the new functions which will enable us to get the most out of it. It is another great piece of technology that helps our business move forward at a lightning pace. All contractors need to email invoices now!!! To any contractor still sending your invoices in the mail ... Stop !!! Change your habits !!! Now !!! Forget for a moment about the product I am using, and think about the process. Old way: Stack up invoices and eventually mail them at a cost of about fifty cents (paper, envelope and stamp), wait a day or two for it to make it to the customer. Wait for whenever they open the mail and then they send in the money whenever they want. New way: Send out invoices electronically as they are created at a cost of nothing (assuming you already have an internet connection while reading this). Wait 10 seconds for it to be in the customers hands. Of course you can not control when they pay you, but you will be surprised how easier it is for them to tell you when they will pay, or why they may not be paying you on time, or at all until something else is addressed. I would even send an electronic copy even if you dropped off an invoice at the customer's house since there is a good chance it can be misplaced. Bottom line: You save money simply getting the invoice to the customer more efficiently and you save time waiting to get paid or communicated to. Time is money. I know this seems basic, but I just had two sub-contractors of mine walk in together who were surprised about the number of checks I was calculating. It hit me that I take some of these things for granted and just wanted to share it with the community. It amazes me when people get excited about something that I do passively - then I realize what makes my company and others that are on this forum successful - we are progressive. Are you hesitant to try a new software product for whatever reason? Here is my idea. Simply create a few invoices in Word or Excel and email it to your customers to give it a try. Compare the responses to another set you send in the mail. I am sure you will then look in the mirror and wonder why the heck you did not automate yourself before. This alone can help offset some of the costs of not being automated. Help advance the industry as a whole and jump on the bandwagon. Good luck out there. PS. One of my subs finally got a website after we stronghold him and he has already gotten jobs and other outstanding requests in a few months after posting it. Finally sent first invoices out with email. Was suprised that a check came in on Thursday from invoice sent Monday. I know, I owe you a beer on our bet. Am sure you will enjoy rubbing it in my face. Air conditionong service, repair, maintenance and installation in South Florida, Palm Beach County. We have signed up with MyOnline Toolbox - I was amazed at how simple it was to enter my information, get bids out and communicate with our client. As much as we are "in the field", having a resource like this is going to streamline our "paperwork" so nicely. Time saving = money making in my book! has anyone out there looked at Builder Trend; www.buildertrend.com ? This looks like a similar server based solution for invoicing, crm, sub contacts, etc. I performed a test drive on the product during the dev\beta period of the latest version, let me first add that I am not a reseller nor an employee, but it is my job to stay up and knowledgeable on new products to be better informed. That said, I am a firm proponent of web based applications for many reasons, and if they happen to be user friendly and intuitive even more so. I personally have moved the entire office onto web based email and CRM tools-the phone switch and fax infrastructure to virtual pbx vendors, and eventually every other process we perform that I can. A quick explanation of the thought behind it is a simple realization, I have time to sell, manage, design, and grow a company, I don't have time to beta test software applications, troubleshoot software installations with India for a day or even week and in the event the hardware fails spend another two days reinstalling applications and resurrecting backups. What I see in myonlinetoolbox is pretty much what I described above, web based, very little maintence, two hour learning curve, no backup headaches, access from a laptop on the beach in Costa rica, or work from a laptop in the cab of your truck. The support team is US based and quick to respond to questions, usually got back to me within 15 minutes or less. "I had a few markup and waste field questions"
Within one hour of use I was able to build a short customer list, invoice templates, basic reporting, quick estimates, and a basic cost database with normal office phone interruptions and turmoil. This "is what it is", a simple low cost easy to use\learn web platform for communication, not a fly to texas and train for a week robust algorythm loaded cost estimating application that requires a computer science degree or related training to use properly. The unfortunate part of this is I loose billable hours of troubleshooting and training when products like this are released. I ended up scraping the Tool Box. It is a great idea and I thought that we would get used to it - but I never did like the way it flowed. No matter how simple or affordable - if my software dosent feel right then I won't use it. Just updating all from my Aug 8 post and can see some new opinions. some corrections that should be understood based on the posts since then. Jesse made mention of the flow. there were a few things confusing when I started using the system in July but a lot was cleaned up with their release in December. It really was small stuff, but I can see why Jesse was confused and also know why Phillip Arnt made his positive comments which are different than Jesse’s. jesse had a valid point on a few areas from the summer of 2008 but a new user would not see the same since the guys listened to the suggestions and fixed them. They are very big on making it easier for us simple guys. My name is Pat and I found out about this place from advertisements inside my business tool I use. I didn’t know this existed so I figured I would check it out. I’ m new to internet things and started to use to get some bids and jobs working for a contractor I know. Pretty cool that I signed up and all my business informtion was there, then I picked up the job info for me to bid. I got the job and go back and forth with the contractor until the job is done. What I like is that all the details are there so I do not have to play the phone tag game. At first I thought Mytoolbox was just for the contractor I got the job from them realized I can do other things on my own. Easier than I thought. Anyway, seems that this contractrtalk is better than myspace. Not sure what else to say except good luck with business you all. I usually hate talking to programmers with all their little gadgets and making me feel inferior. I started the estimating and playing around with the work orders. thought i was going to get into a debate if i gave toolbox guys a suggestion and would be brushed off. I didn’t understand why are people forced to enter a default grouping name before entering tasks, materials and expenses. emailed a few times to a guy named Adam who taught me why people use the feature AND THEN I convinced him why REALLY SMALL GUYS like me may or not need it. I thought he was just being nice and telling me it was a good idea to program. I was happy to see they just added a way to skip over the grouping field. biggest thing I see is this is simple for little guys but you may bump into a few features that are more for a bigger company. so far so good. I am going to try to make something not work to see if I can get a six figure tech job some day. Will get back to you all soon. I went to their website and gave it 5 minutes of my time and got nothing out of it. I found the overview to give me a vague idea of what their stuff does. I maintain customers, create estimates, change orders, etc. through Microsoft Access. Use Outlook for email and it has a calendar that I schedule workflow and get reminded through the alarm feature of upcoming jobs/estimates/pick up materials/get grocieries/buy flowers. I communicate with employees by being at jobsite, or getting a call to come to jobsite. I would be mad at my employees if they stopped working to look on the computer for a "work order". I rather just convey the order of operation face to face. And I leave a sketchup design of how the job should look and they can call me to come by to touch base on any little detail stuff. 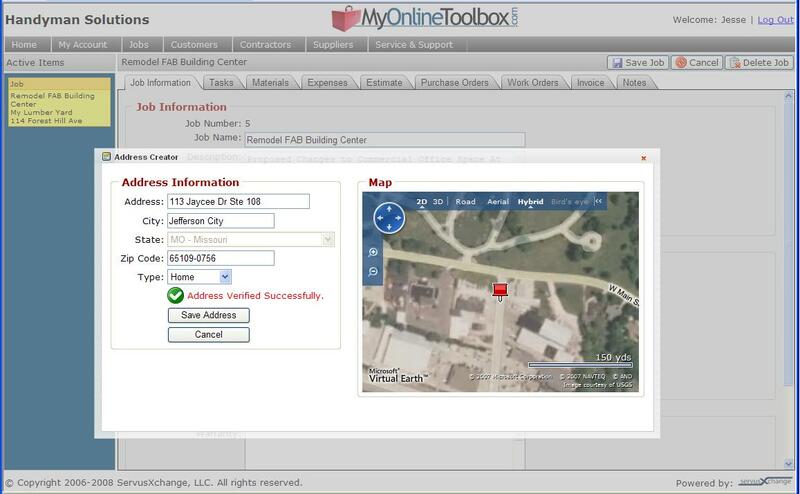 So why again would a contractor need this "onlinetoolbox"? I'm getting by good with the Microsoft Office Suite installed on Vista, Google's free Sketchup, and an unlimited call/411/text/web $52/month cell phone plan. I have a free version I am testing and the idea behind seems sound. I would think for a mobile contractor that does most of the work himself or a sub this would be a nice program. Do a estimate email it, send out invoices, check for bids. etc. The thing with software is that it has to fit the way you do business or it will not work. If you are not comfortable with it i don't care what it does or how it does it it won't fly. It's free. so try it out if it fits cool if it doesn't move on to the next one. +/-90% of my customers are homeowners. If I resorted to just emailing proposals my closing rate would sink. And I'm still not understanding why I need additional software besides Access to generate an estimate to email? I was just forced to explain your post when two of my subs asked me what you were referencing while reading in our office. Biggest thing is that most contractors are not into any programming such as Access, or just do not have the time. You & I and other more progressive ContractorTalk forum members are more technical than the majority of the industry, but we are the minority (not bragging). The vast majority of simpler guys need something for the basics but will never do anything on their own. Many of the smaller independents just want to turn on something and use it, now and as inexpensive as possible.